ANSYS Polyflow accelerates design and optimisation of processes such as extrusion, thermoforming, blow molding, glass forming, and fiber drawing, making your manufacturing processes more cost-effective and environmentally sustainable. 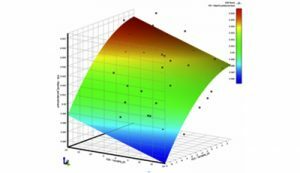 ANSYS Polyflow’s unique inverse die design capability can identify final die designs much faster than traditional build-and-test methods. This translates into substantial cost reduction and time savings. Your team can improve the quality of blown and thermoformed products by running trial-and-error processes with ANSYS Polyflow, rather than testing changes on the production line. You can also model the deformation of molten plastic pushed through an extrusion die – simulating the flow within the die, predicting the extrudate shape for a particular die and predicting the required die shape in order to obtain a desired extrudate shape. Packaging is important to protect products from damage — but it is also a sustainability issue, as well as an additional cost to goods suppliers. Deploying virtual prototyping using Polyflow enables you to model the package manufacturing process. 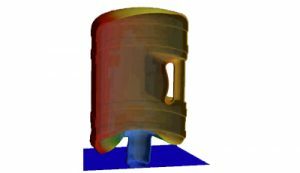 By coupling this solution with ANSYS structural products, your R&D team can evaluate and test a design’s behavior and durability. You can take corrective action at the design or manufacturing phase, or both, to quickly and cost-effectively design lighter packaging with better performance. ANSYS PolyFlow allows companies to virtually design and test extrusion dies. Users can simulate the extrusion process and automatically perform die shape optimization. 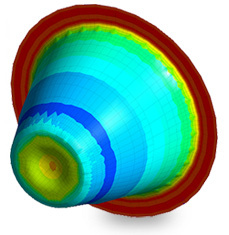 ANSYS Polyflow includes a vast library of mathematical material models so you can understand and accurately characterize material behaviour. Simulation enables you to test the ability to process new resins, even before they have ever been produced, by comparing prototypes for different materials to see if they match or outperform existing and competitive materials. You can reverse-design a resin to maximize end-product performance while minimizing costs and environmental impact. ANSYS Polyflow models include viscous heating to allow you to detect potential deterioration of a polymer grade or undesired rubber curing. Accurate modeling of high-temperature processes, such as glass forming, requires the use of advanced nonlinear material properties, accurate radiation prediction (using, for example, the discrete ordinate radiation model) and the Narayanaswamy model that accounts for material stress relaxation during the cooling process. 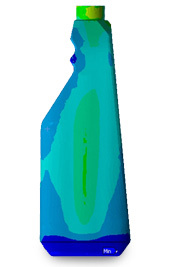 Polyflow includes native fluid–structure interaction (FSI) to model thermomechanical interactions between flowing materials and surrounding solids in a fully coupled approach. When large deformations occur within the elastic zone, the mesh resolution is automatically refined to improve the quality of results. Designing equipment and processes for best results involves evaluating multiple designs and optimising flow and geometric parameters. With Polyflow, you can declare any scalar as an optimization variable, including rheological parameters, boundary conditions and mesh displacements. Then you can use the built-in optimization algorithm to automatically minimize or maximize a given objective function based on input parameters. Now core Polyflow capabilities are also included in ANSYS AIM, the easy-to-use simulation environment designed for all engineers.